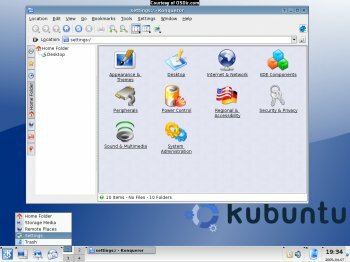 Kubuntu uses the solid base of Ubuntu plus the latest KDE. They are part of the Ubuntu community and use their infrastructure and support. It includes some of the best in translations and accessibility infrastructure that the Free Software community has to offer, to make Kubuntu usable by as many people as possible. Much better than GNOME desktop with it's pulse audio. Sound on Kubuntu is super clear. Love Ubuntu, Love Gnome, cannot STAND KDE... WAY too window like... ugly as hell interface.... many will argue with me, and that is fine, glad its here for those who like it. KDE just seems.... anti-linux esque to me. Canonical does not make crap. KDE has come a long way and it's quite cool. If you like lightweight Xfce, then that's your preference, and no need to bash desktop environments that are different. Stay away from this crap. Xubuntu is decent compared to Kubuntu. I have downloaded the image 3 times, got no errors however each time I try to burn the ISO, It craps out with a crc error at the same place. Me thinks the download be bad? Anyone know how I can get a cd mailed to me of the intrepid release?? Ditto to my review for Ubuntu, but why do they both need to be listed? They're damn near the same thing. I'm not even using this, I just like to use my extra bandwidth for the torrents. Oh yeah! A lot more! I prefer Gnome, but I still like KDE. However this should be renamed since Kubuntu 8.04 is NOT LTS. Um no I have not option for KDE 4, but I did get Fluxbox running on it in very little time and it is much faster. I have never been a big fan of KDE, it tries to hard to look/feel like winblows, which is why I moved to Linux in the first place. To use KDE 4 (which is still a little slow) simply select KDE 4 from the login manager on the initial login screen after install.